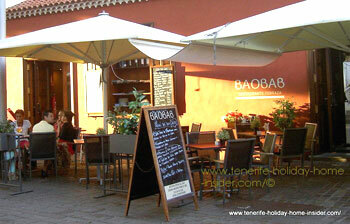 Restaurante Terraza Baobab is good for Tenerife Tapas. Restaurant Restaurante Terraza Baobab is classified under Mediterranean cuisine. However, we found it ideal for a short Spanish Tapas stop-over. Also, it's so conveniently located near my favorite landmarks of the city Santa Cruz de Tenerife. In October 2013, family members who stayed at our Tenerife holiday home and I stopped at the Baobab restaurant of Santa Cruz in the afternoon. This restaurant of La Noria street had a sign which offered food all day from Noon onwards. Tourists are always hungry. This place is just perfect in this sense. You can contemplate most of the highly attractive Calle La Noria with its humming life from the terrace of its Baobab restaurant. That so called party street is one of the oldest and most typical of Tenerife. Where is Restaurante Terraza Baobab ? as little as € 10 or €18 which includes dessert. Of course, this terrace restaurant goes with the festive flow of the Noria attraction of the town. It offers cocktails and drinks galore. This restaurant is one of the modern eating establishments between the Museum of Man and Nature, Theater Guimerá and Plaza de España. Admire a large tree opposite this Tenerife restaurant. You really feel like looking at Baobab tree roots... They are not as big as they get in Africa, though. 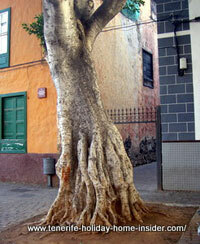 The tree stands in front of a tiny passage called Calle del Miedo. (Street of fear) It leads to the gorge de los Santos by the Museum of Man and Nature. Around the corner from our restaurant terrace is Calzada La Noria. It takes you to Plaza de Isla de la Madeira and also to Plaza de España. big like pigeon eggs or 4 or 5 normal olives put together but still bite size food. By the way, this finger food of very healthy snacks was served for sharing by one plate of each. 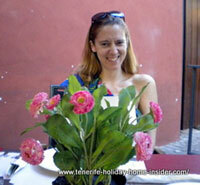 This is typical for this kind of Tenerife Tapas. We had cool drinks and water, as driving a car was still on the agenda. Details of the decor of Restaurante Terraza Baobab were also most enchanting. For example, fresh table flowers set a charming accent for a picture of a member of my family. They were part of a real little pot plant and a symbol of eternal Tenerife Spring. The attentive waiter moved the little pot aside before she brought the food. Also, this Noria restaurant has the most amazing bathroom. It isn't only fit for disabled people. There also is a fold-back table for changing a baby's diaper. A very simple 3 or 4m high waterfall on a painted mural between two flights of stairs provides a natural background sound of running water. It's said to come from a fountain. No roof is above the steps of Restaurante Terraza Baobab, except by the Azotea. You see the running water when you walk into the large eating hall with the downstairs bar of the eating establishment. It really offers a stark but pleasant contrast to other eating places of the Santa Cruz Tenerife Fiesta street some of the attractions of which lead you way back down memory lane, indeed. From Restaurante Terraza Baobab back to Tenerife restaurants. By the way, the restaurant has its own Baobab Facebook page with videos of its life music. There are also many mouth watering food photos. About the Baobab trees here.